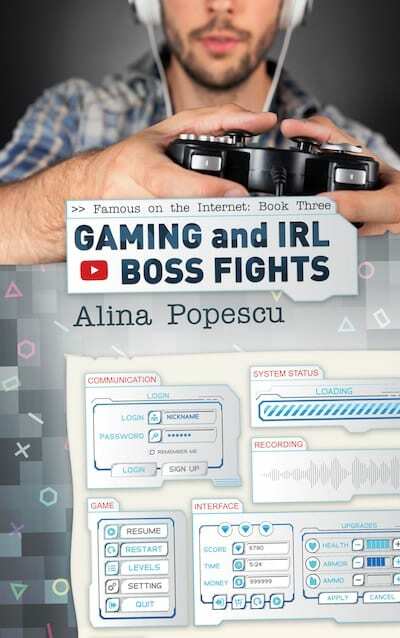 I’m happy to have Alina Popescu on my blog today to talk about her love of gaming in honor of her new novella, Gaming and IRL Boss Fights, the third book in the Famous on the Internet gay romance series. Read on to enjoy her ode to gaming (she mentions Frogger, so of course she’s won my heart), and then check out her books below! The first time I played the video game was during my informatics class, when I was about fourteen. For half of my class, which consisted of two hours a week spent in the informatics lab, I tried to make a rider and his horse get past their third obstacle. I always failed, but I kept trying to beat this Summer Olympics–inspired game. Later, I discovered Frogger or on my then boyfriend’s computer. I was in high school by then, but still as bad at making that frog jump across the street in heavy traffic and keep it from dying. My first gaming addiction, however, happened in my last year of high school. This was my first experience playing a real-time strategy game and I got hooked on playing Dune 2000 with my cousins. They were far better, but indulgently watched me struggle to survive the harsh deserts of Arrakis. It wasn’t until university that the gamer in me blossomed. I’ve been known to skip on uni classes to play Heroes of Might and Magic. No joke, full days spent not going to class, and playing games. My favorites at the time were Heroes 3, Heroes 4, and Unreal Tournament. Since then, I never cured my slight addiction to gaming. I happened to find a game, fall in love with it, and play it for hours and hours every day. As I took my responsible-adult role more seriously, I started limiting my gaming time. After years and years of experience, I know quite well when to cut myself off or when to not allow myself to play at all. You’d think that after all this time, I’d be better at games. I can manage with some, but I definitely am still crap at platformers. Just watch my random footage from Cuphead if you ever watch my writing vlogs on YouTube. I died a lot in this game. I died so many times in Cuphead, I am tempted to make a compilation of 1,001 deaths. I still have to die a few hundred times, but it’s not that much of a stretch to get to the 1,000 milesone. Despite my mediocre skills at gaming, I still love them with a passion that will never be extinguished. I love the character design, I love the stories they tell, and I love the thrill they bring when you succeed in achieving a goal. Be that to survive the next five minutes, beat the game, or just finish a quest with other gaming friends. After over twenty years of gaming, my latest release, Gaming and IRL Boss Fights, is my ode this form of entertainment. Or form of art, depends how you look at it. Of course, my protagonist, Simon, is far more skilled than I will ever be. He actually knows what he’s doing, and is successful at it. He is a gaming celebrity, and a YouTube and Twitch star. Enough to say, I did not write his skills based on my own. That doesn’t stop me from loving games just as much as any other skilled game. It feeds my geeky streak. And I’m happy with that side of me, with the nerdiness of it all. Let’s face it, I’ve loved books, writing, manga, anime, and video games for a long time. It’s not like I’m even trying to kid anyone I’m cool. And yet I am, in my own way, because the video gamers I follow, am friends with, or date (my boyfriend’s skills might have been a huge inspiration for this book), they are all amazing. I think they’re as cool as anyone can ever be. So if you are a gamer, or know one, I think you’ll enjoy Gaming and IRL Boss Fights. Even if it’s basically a love letter to video games from a geeky girl in Romania.